We carved beautiful pattern of flower baskets to a large extent. These flower basket can be delicately placed in dressing room, living room or corridor to enhance their splendor. It is made from silver and can be annex with any other colors. The flower baskets are Kashmiri flower baskets of high quality. Can be available in various sizes and. pattern at the wholesale prices. 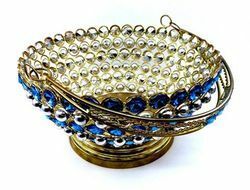 We are amongst the most reputed names in the industry, offering Brass Flower Basket. size--top dia 13"bottom 11" ht 12"
Banking on our enriched industry experience, we are able to supply Brass Flower Baskets. We are reckoned entity of this domain indulged in providing an enhanced quality Garden Flower Bucket.